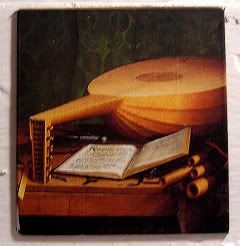 It almost seems that the magnet is not of the original painting, but rather of a simpler painting, a still-life study of just two small component. There's only so much detail you can get in a magnet, so perhaps it was a conscious decision to distill a certain element, one that makes an attractive snippet. Or... someone messed up and got snip-happy with the photoshop. Not like *that* never happens. Well, now I'm worried it's not the right painting! Heh. And, I suppose the skull wouldn't have been a pretty magnet.